An in-process version of 'MonetDB', a SQL database designed for analytical tasks. Similar to 'SQLite', the database runs entirely inside the 'R' shell. MonetDBLite works seamlessly with the dplyr grammar of data manipulation. For a detailed tutorial of how to work with database-backed dplyr commands, see the dplyr databases vignette. To reproduce this vignette using MonetDBLite rather than RSQLite, simply replace the functions ending with *_sqlite with the suffix *_monetdblite instead. If you encounter a bug, please file a minimal reproducible example on github. For questions and other discussion, please use stack overflow with the tag monetdblite. The development version of MonetDBLite endures sisyphean perpetual testing on both unix and windows machines. 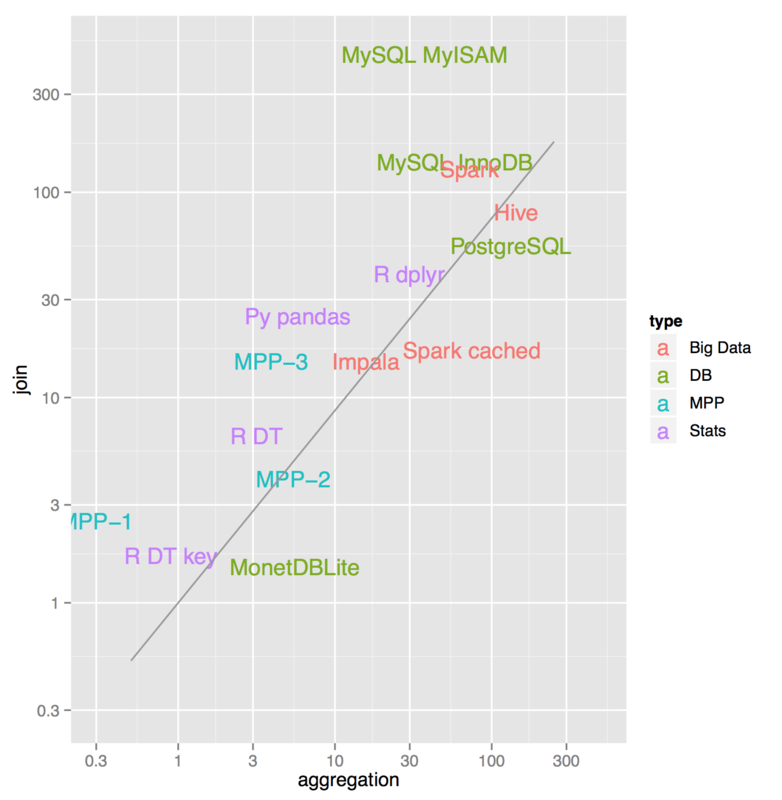 MonetDBLite outperforms all other SQL databases currently accessible by the R language and ranks competitively among other High Performace Computing options available to R users. For more detail, see Szilard Pafka's benchmarks. Note that MonetDB may hiccup when using network drives, use servers stored on the same machine as the R session. Note how we wrap the two commands in a transaction using dbBegin and dbCommit. This creates all-or-nothing semantics. See the MonetDB documentation for details on how to create a table and how to perform bulk input. This section reviews how to pass SQL queries to an embedded server session and then pull those results into R. If you are interested in learning SQL syntax, perhaps review the w3schools SQL tutorial or the MonetDB SQL Reference Manual. MonetDBLite does not allow multiple R sessions to connect to a single database concurrently. As soon as a single R session loads an embedded server, that server is locked down and inaccessible to other R consoles.